my scandinavian home: Twinkle, twinkle little tree! The Scandinavians generally start decorating their home for the holidays on the first Sunday of advent (is it the same where you live?). As with all things Nordic, the decorations are beautiful in a fuss-free, subtle way. Think earthy colours, natural textures and plenty of foliage for perfectly imperfect vignettes. Every year we head to the forest to cut down our Christmas tree (one of our family's favourite days of the year, not just because there's glögg and pepperkaka (ginger thins) involved, honest!). 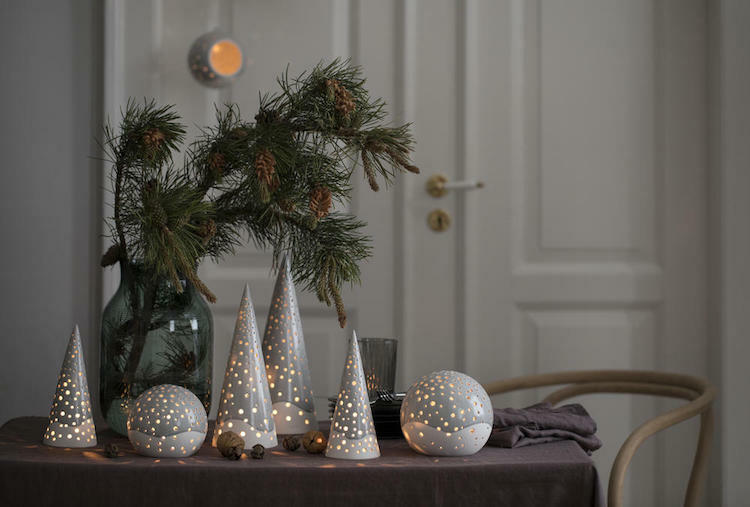 But this season I'll be bringing in another type of tree too - the Nobili collection by Denmark's oldest ceramics brand Kähler. 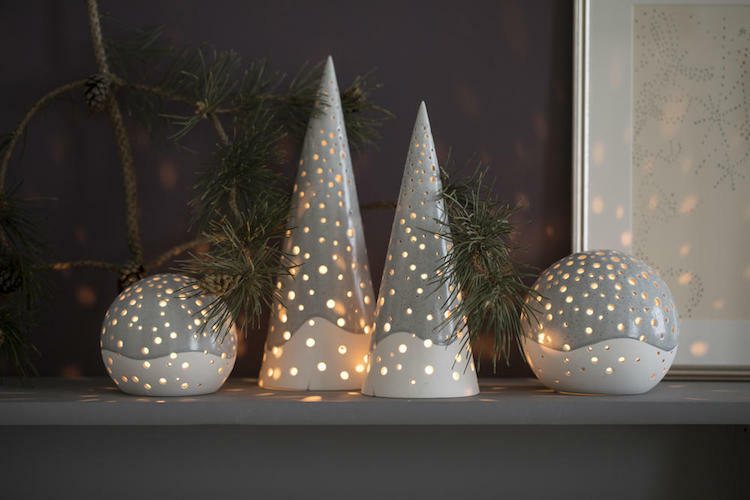 Designed by Mette Bache and Barbara Bendix Becker, Nobili is a pretty series of six hand-decorated ceramic candle holders inspired by the clear frosty nights of the winter forest. Each is perforated with holes to allow the warm glow of candlelight to cast pretty shadows on the wall. Not only does it make for a cosy display on a table, mantel piece or windowsill, if you're very tight on space at home it's the perfect mini Christmas tree alternative! dance and the stars glimmer in the soft, freshly fallen snow." "When darkness falls and the moon shines in the clear night sky, the shadows dance across the frozen streams and the soft, freshly fallen snow that covers hills and trees. It is these evocative hours and the wholly unique light of Nordic forests that inspired the range’s dark, vivid glaze." Aren't they beautiful?! Sooo cosy too. I love how pretty the dusty green, mouth-blown Omaggio glass vase looks in the vignette on the table too. "When the dusty green vase is combined with other shades of green, it creates a shadowy, fascinating contrast to the pale, Nordic aesthetic," the Kähler team explains. Yep, totally agree. It's very subtle and ideal for fresh sprigs of pine and other foliage gathered from the garden / nearby park / forest / through the cracks of the pavement - the more imperfect the better! You can pick up items from the Nobili collection and Omaggio glass range over at the Kähler web shop and a whole host of design shops (find your nearest retailer here). This post is brought to you in collaboration with Kähler, however all words are my own and I only ever work with brands I love and think you will too. They are lovely but rather expensive. 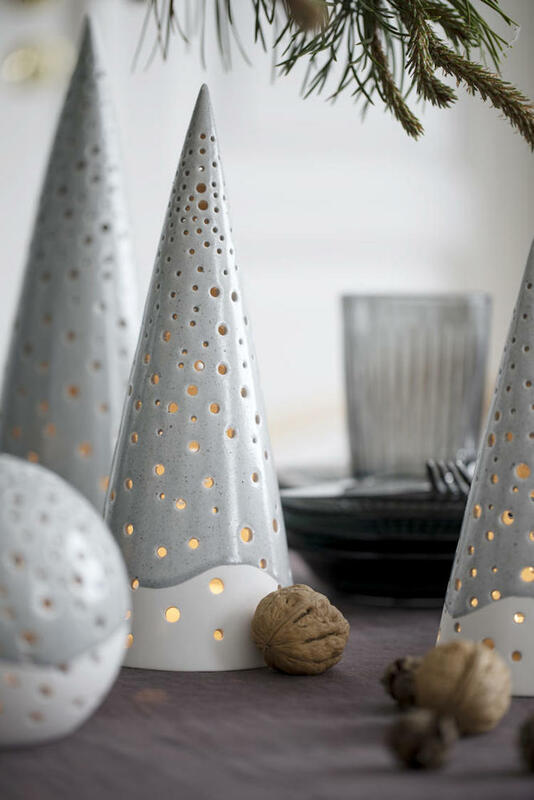 The cone-shaped candle holder comes up to $68 Canadian, that's a lot of money for something that you typically have to buy at least in triplicate. Aren't they beautiful @Of ashes & amp:Bones?! Alena - it's the kind of item you invest in and bring out for years to come to make your home super cosy. I actually think you could make one single on work alone beautifully? Any chance those trees are available in the States?